Active Whitehorse News – October/November 2017 | Whitehorse Active Transport Action Group Inc.
WATAG has launched its online survey to get a wider community view about people’s present use of Active transport to travel to activities which are part of their everyday lives. We would like to know whether people would like to use Active Transport more, and to find out what are some of the inhibiting factors. To encourage participation, you have the chance to win a great 21 speed Hybrid City Bike just by telling us what you think. The closing date is 30th November. We encourage you to fill out the survey. And don’t forget to suggest to your family, friends and colleagues to enter too. Here’s another survey you can help with. This survey asks “what are your public transport peeves?”. Click this link to have your say. Locals in Blackburn might like to comment on Blackburn Station and give their views on the way it was NOT upgraded as part of the grade separation project. WATAG believes that the result of the changes to station access has greatly reduced ease of access for people crossing in a north-south direction as part of their Active Transport commuting. A wide underpass should have replaced the existing narrow tunnel as a minimum, and the station itself upgraded. The current Bicycle Strategy doesn’t get a mention and should, especially as the Pipe Track is mentioned, and more than that, it broadly relates to getting more people more active more often. Whitehorse Cyclists Inc. hasn’t been mentioned in the document and should be given their role in getting mainly older folk active and socialised. There is no mention of the need for low stress easy ride routes to link to existing shared paths, schools, railway stations, community hubs etc. WATAG acknowledge the value of dog walking as a way of encouraging outdoor activity and the need for managing the dangers they present when off lead on the major Shared Paths used as active transport routes by commuting bike riders e.g. Gardner’s, Bushy and Koonung Creeks. The submission also noted the need for physical contentedness and accessibility for Active Transport, improved Council response to community concerns, and recommended adoption of achievement measures for these matters. The submission can be read by clicking here. VicRoads are encouraging more walking and cycling as the best way to stay healthy and get around. What a GREAT ENDORSEMENT of WATAG’s Active Transport principles! WATAG responded to the request for feedback. Following a meeting at VicRoads a submission was made with some detailed suggestions for VicRoads to consider. WATAG believes these changes will help make the proposed VicRoads route enhancements even better. WATAG Committee were very active at the Whitehorse Spring Festival ….which is as is should be for an Active Transport Action group! There were bikes of many sizes and configurations for people to see. The Prize Bike for the survey was on display, a tandem bike and we were lucky enough to have Murray Scott supporting WATAG on his fabulous Penny Farthing bike. It was great to welcome several Councillors to the WATAG stall. Congratulations to Cr Blair Barker for being truly Active and riding his bike to the Festival. The challenge is out to try and make Active Transport the preferred mode of travel to the Festival for next year. What’s the situation in Victoria in 2017? Unfortunately legislation to bring Victoria in line with all other states (except NT) was defeated earlier this year by the Victorian lower house. Click here for more information on this important safety issue for cyclists, and how you can help. 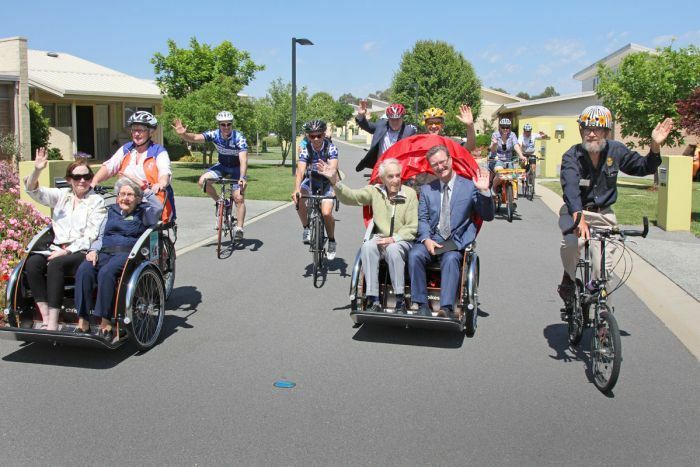 Cycling Without Age: Danish trishaw movement launches in Australia to benefit the elderly. Click here for an interesting report on the ABC. Rip up CBD roads for parks: Councillor reveals vision for Melbourne. Herald Sun report: Melbourne City Council plans to redesign the Sandridge Rail Bridge to replicate New York’s famous Highline linear park. “Chair of Melbourne City Council’s transport portfolio, Cr. Nicolas Frances Gilley, has called for roads to be converted to “linear parks” reserved for trams, cyclists and pedestrians, and he supports making a rail link to the airport a priority. WATAG would be very supportive of local action in Whitehorse to slow traffic and convert some local streets or street entrances to linear parks to enable all residents to enjoy their local environment without suffering car rat-race intrusions.